Down a winding country road behind what could be someone’s farm is a haven for those who love burnouts and straight-line speed. 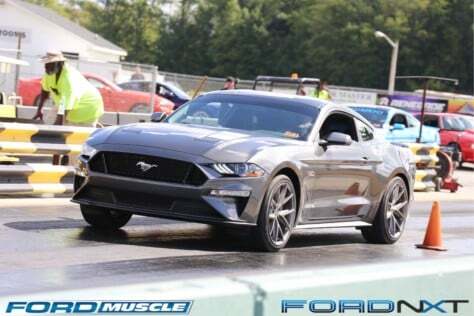 This bastion of legal racing is North Myrtle Beach Drag Strip, and since last year it has hosted the official eighth-mile action during Mustang Week. 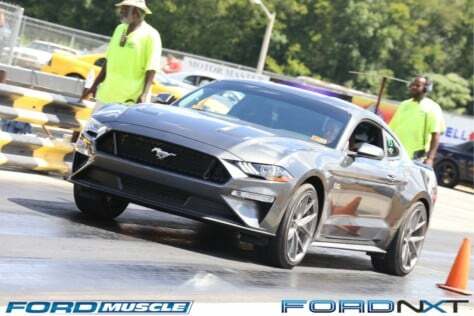 Set up in a run-what-you-brung test ’n tune format, this event allows participants – from experienced to neophyte — the opportunity to run down the drag strip in their Mustangs (and other Ford-powered rides). On a warm, beautiful day, approaching 200 vehicles did just that. And, with a manageable level of participants, there were plenty of passes to be had by all in attendance. 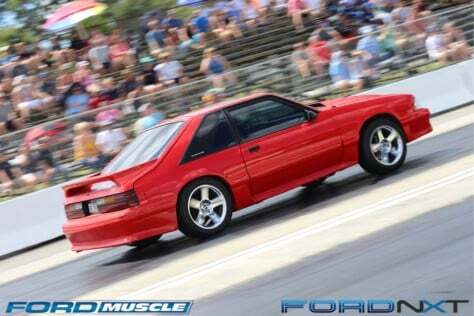 We spotted Mike Anderson’s Fox at the Meet ’N Greet and had to learn more about its wild combo. It is powered by a Rich Groh Racing Engines-built Three-Valve 4.6-liter engine topped by a Holley lower intake, a Shearfab intercooler center section, and a KML Performance custom upper. 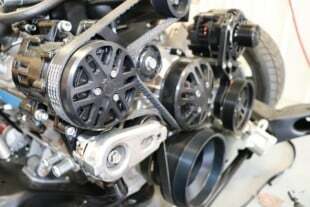 It is fed by two Precision 66mm turbos and controlled by a FuelTech FT500 standalone EFI system. All told it puts down well over four digits at the wheels, but Mike is still dialing in the tune, and this was its maiden voyage down the track. 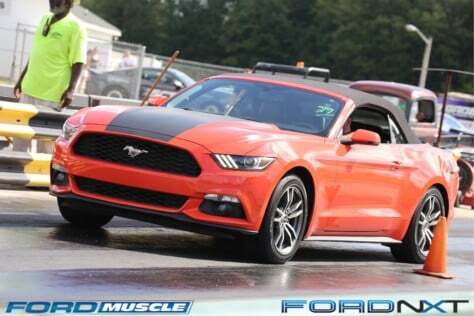 Cliff Elliott’s 2016 Mustang GT is a multi-talented machine. 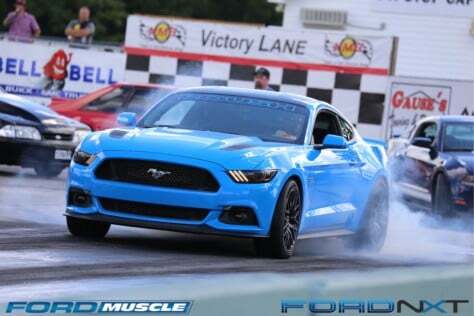 A regular on the Optima Ultimate Street Car Challenge circuit, this S550, which is known as Code Blu, can turn and burn. 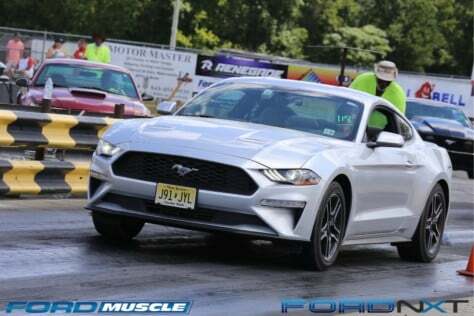 Fresh off winning the Gateway Classics autocross the day prior, Cliff was out racing his naturally aspirated machine at the drag strip. Powered by a built 5.2-liter engine topped by ported Voodoo cylinder heads and Cobra Jet intake, it pumps out over 549 horsepower and 454 lb-ft of torque at the wheels. 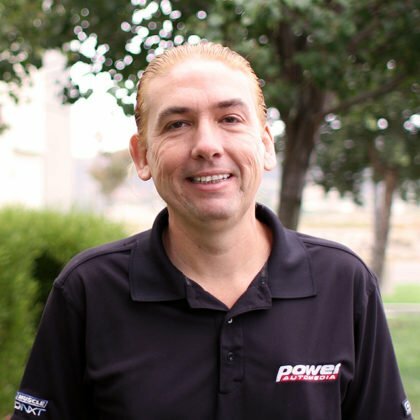 Unfortunately, Cliff’s clutch was acting up, so he had to take it easy so he could drive the car home. Indeed it was. 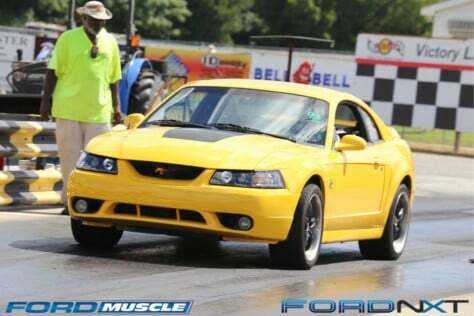 There were smiling faces in the stands and behind the wheel of Mustangs all over the property a NMB Drag Strip. 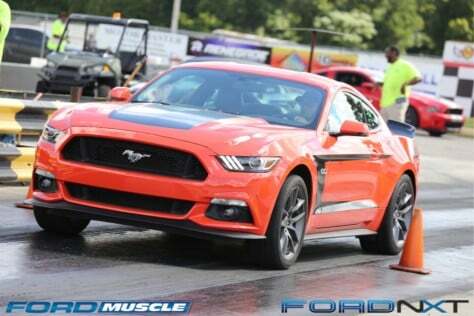 Thanks to the support of a company that knows a thing or two about supporting drag races, the event offered a sanctioned way to let those ponies gallop. Talk about a putting a fresh face on a blast from the past. Your scribe was smitten by Earl Michael’s Fox coupe. It was showing off in the UPR Products booth, and for good reason. He bought the car in rough shape and brought it back with a complete freshening of the body and paint. It still has a vintage Ford Racing crate engine under the hood, which is fitted with a classic B303 cam and pumped up by a Vortech T-trim. It makes 440 at the wheels on good gas, but better yet the lopey cam sings a sweet song through OG Flowmaster two-chambers. This car is what Earl wanted in high school, and it’s just what the nostalgia doctor ordered today. Caleb Skinner, of Fastlane Motorsports, is known for building and racing some fast cars, but his latest project blends the propulsion of a Kenne Bell-boosted Coyote with the cool of a rat rod-style F100 pickup, which goes by the DirtBagr moniker. He ran some eights in the eighth-mile, but this one looks like just as much fun to cruise the streets of Myrtle Beach in. We spent the better part of the day snapping shots as cars efficiently made passes. 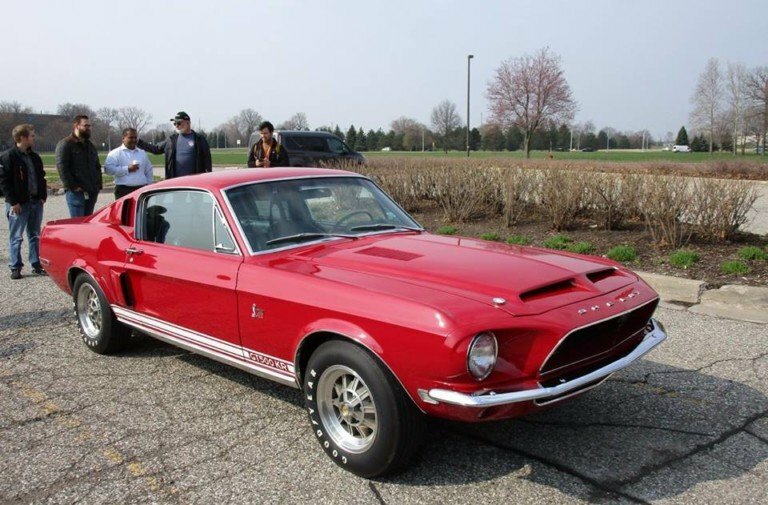 We saw everything thing from fresh-off-the-lot 2018 Mustangs to heavily modified classics and everything in between. Better yet, most of these cars were driven there and several had participated in other Mustang Week activities, like the autocross and Fun Runs. These are true enthusiasts, which is why so many companies come out to support the event. 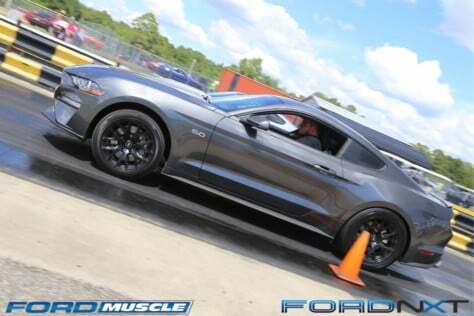 Fresh off taking top honors in Pro Dyno’s Battle at the Beach chassis dyno competition, Steve Shrader banged of some passes in his 1,020-rear-wheel-horsepower, Coyote-swap New Edge. 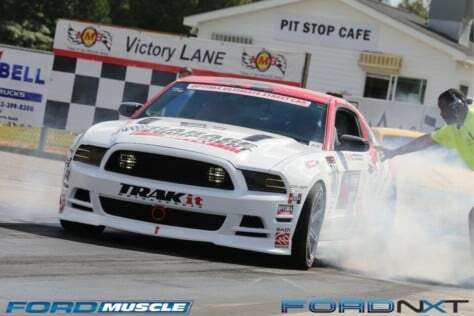 Its built 5.0 is boosted by a Vortech YSi-Trim supercharger and he has some nitrous onboard as well — just in case. 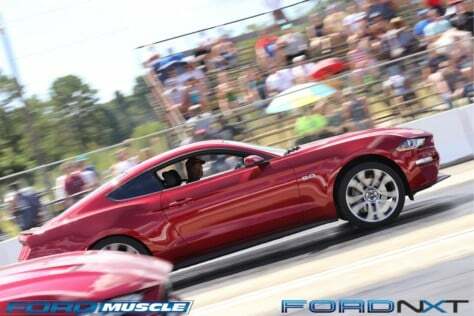 Moreover, since moving to NMB Drag Strip last year, all of the Mustang Week events are in close proximity, which lets attendees enjoy everything that the week has to offer. 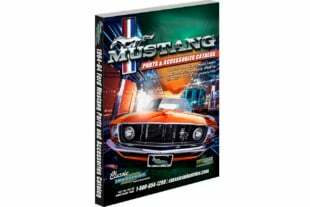 This classic Mustang is obviously built for the strip. Featuring a 502-cube big-block set back several inches and mounted in a serious chassis, the car also has a big nitrous bottle on board for when he displacement isn’t quite enough. 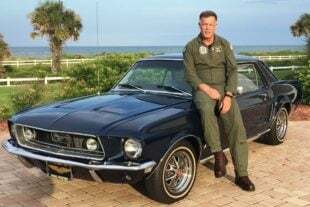 Friday, of course, is the big day, as the crowds will descend on the Myrtle Beach Convention Center for the judged car show, which is the crown jewel of the week’s official events. If you want more info on the schedule, you can visit the official site here. We were surprised to see pro drifter and sometime off-road racer Jonathan Nerren behind the wheel of Jason Brozak’s wrapped S550. Jason, who owns Just the Dipz, wanted Jonathan to make a test hit, and who was he to say no. Besides, Jonathan got to prove he can burn some tires and keep the car in a straight line.